The Armed Forces Press Service has initiated a propaganda campaign designed to convince the American people that deploying the 3rd Infantry Division in the United States in violation of the Posse Comitatus Act is a good thing. The propaganda piece appeared on the Hinesville, Georgia, Coastal Courier’s website on December 26. 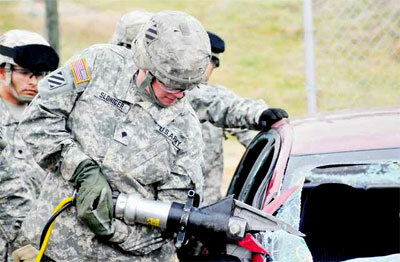 This photo of a soldier using the “jaws of life” in a Northcom training exercise in Maryland accompanied an Armed Forces Press Service propaganda piece posted on December 26. In order to portray the military as humanitarian saviors, the Armed Forces Press Service included a photo of a soldier wielding the “jaws of life” during an exercise that included “buddie teams” recently returned from Iraq’s Anbar province removing mannequins from the rubble of a collapsed building. Earlier this month, Branson Hunter, writing for the Big Bear Observation Post blog, reported on the Marine Corps Air and Ground Combat Center and the California Highway Patrol working together “in a joint effort to reduce accidents and drinking and driving” in San Bernardino County, California, a direct violation of the Posse Comitatus Act (18 U.S.C. § 1385) passed on June 16, 1878. Infowars covered the story in-depth. On October 1, 2008, the U.S. Army announced its 3rd Infantry Division’s 1st Brigade Combat Team will be under the day-to-day control of the Northern Command, ostensibly “on call” to respond to emergencies and disasters. The recent exercise staged out of the Naval Support facility located at Indian Head, Maryland, is likely only the first of many such exercises that will receive media coverage in order to acclimate the American people to the high profile presence of soldiers on the streets under the control of Northcom. 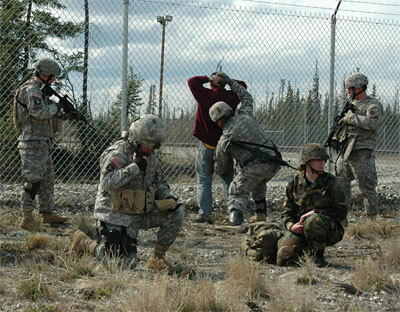 A photo posted on Northcom’s website. Note the civilian being frisked by soldiers. Gates’ review and the deployment of the battle-hardened 3rd Infantry Division’s 1st Brigade Combat Team under Northcom control for “domestic operations” follows the passage of the Defense Authorization Act of 2006 and the John Warner National Defense Authorization Act for Fiscal Year 2007. Section 1076 of the Warner bill changed the name of the key provision in the statute book from “Insurrection Act” to “Enforcement of the Laws to Restore Public Order Act.” The Insurrection Act of 1807 stated that the president could deploy troops within the United States only “to suppress, in a State, any insurrection, domestic violence, unlawful combination, or conspiracy.” The new law expands the list to include “natural disaster, epidemic, or other serious public health emergency, terrorist attack or incident, or other condition,” the latter not defined or limited. As Jeff Stein, CQ National Security editor, wrote at the time, the Warner bill “virtually invites the White House to declare federal martial law, a fact noted by Sen. Patrick J. Leahy, D-Vt. “The changes to the Insurrection Act will allow the President to use the military, including the National Guard, to carry out law enforcement activities without the consent of a governor,” Leahy said.